My Low Carb Keto Beef Kabobs are a super easy weeknight meal that you can throw together really quickly. 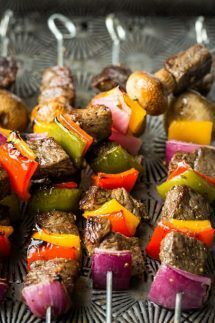 Now they do require a marinate time of a couple hours for maximum flavor, but it’s so simple to make this Beef Kabob recipe ahead of time and then quickly assemble the kabobs when you’re ready to cook! Use the full marinating time for your Keto Beef Kabobs listed in the recipe. If you only marinade the beef for a short time it won’t taste of much of anything. Don’t forget to turn the bag in the fridge halfway so that the meat is evenly marinated. Make sure you use the correct cut of beef for your Keto beef kabobs, I prefer to use sirloin steaks, but as long as you have a cut that will not become tough when cooked quickly you’re good to go! 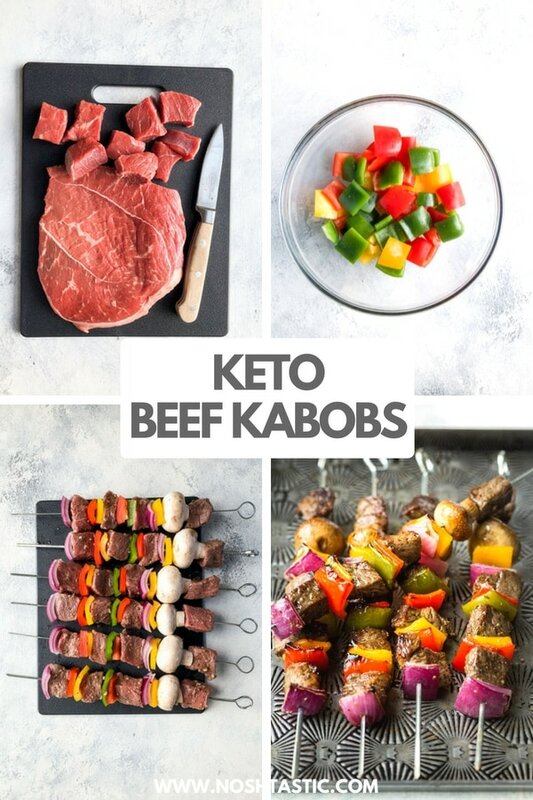 What is the best meat for Keto Kabobs? The best beef for Kabobs is a cut that will remain tender when grilled or broiled, I chose sirloin for my keto beef kabobs because it’s relatively cheap and does not get tough when cooked quickly. Other options include tenderloin or filet mignon but they are much more pricey. How Long do you cook Kabobs? 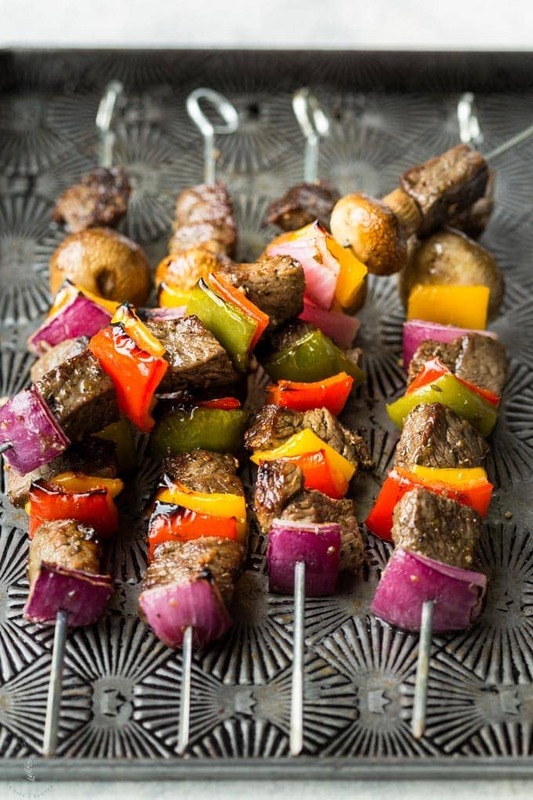 Kabobs do not take long to cook at all and the length of time will depend on whether you cooking them on a grill, which will likely be very hot, or under a broiler. It should take about 4 – 5 minutes per side to cook beef kabobs on a grill, and up to 10 minutes per side under a broiler depending on how far from the heat source your kabobs are. What do you put on a Kabob? We like to make our beef Kabobs with vegetables that cook quickly, add flavor, and fit with our low carb diet at the same time. We chose bell peppers of various colors, a small amount of red onion, and mushrooms for our kabobs. Mix the marinade ingredients into a Ziplock bag then add the chopped steak pieces. Marinate the beef in the fridge for at least 4 - 12 hours for best results, a shorter marinate time will result in much less flavor. After the minimum 4 hours marinate time is up thread the beef and vegetables onto the kabob skewers, do not pack them on too tightly. Brush the grill grates with oil. Grill the kabobs directly over the heat turning occasionally and basting with remaining marinade for 5 to 10 minutes, or until they are cooked the way you like them. Turn on the broiler onto the high setting. 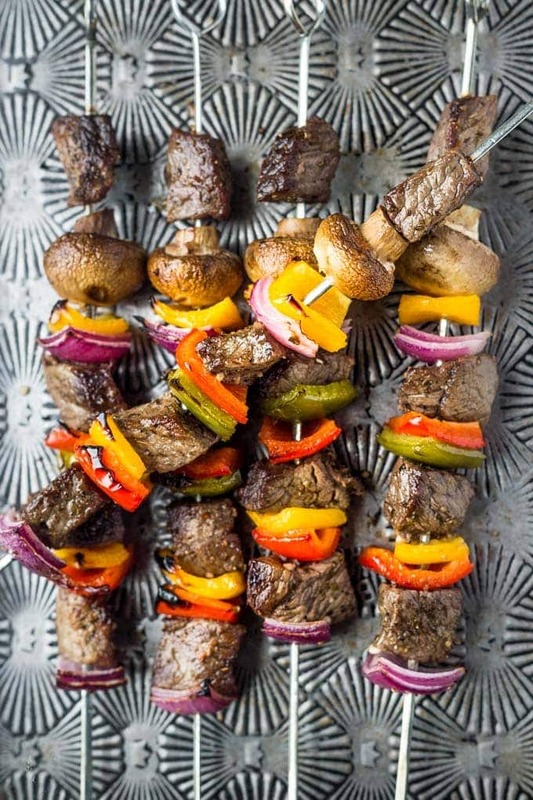 Lay the keto beef kabobs on to a small baking sheet (see photo in post) and balance them so they are not touching the bottom of the baking sheet. Broil for up to 5- 10 minutes per side, turning at least once and basting with remaining marinade until the meat is cooked. 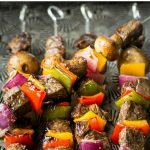 Makes 8 Keto beef kabobs with 3g net carbs per kabob if you use the ingredients as weighed and measured in the recipe. Made these tonight and we were impressed! !